1. Armed Only With Faith: The Civil War Correspondence of Chaplain William Lyman Hyde, 112th New York Infantry edited by Jim Quinlan (McFarland, 2015). This book tells the story of the 112th NY using the unit chaplain's "war diary, journals, reports and letters to his wife." Diary entries are pretty brief but the highly observant letters and reports comprise extensive records of the regiment's service between 1862 and 1865 with the Department of the South and with the Army of the Potomac. The material is heavily weighted toward '64-'65 so will be most useful for the Overland, Richmond-Petersburg, and Appomattox campaigns. Hyde documents the situations of the regiment's sick and wounded regularly and at great length. Annotated by editor Jim Quinlan, this well organized book looks like a valuable resource. 2. "To Prepare for Sherman's Coming": The Battle of Wise's Forks, March 1865 by Wade Sokolosky and Mark A. Smith (Savas Beatie, 2015). In March 1865, Jacob Cox gathered together a small Union army on the North Carolina coast and marched inland toward Goldsboro to link up with Sherman coming up from the south. At Wise's Forks, Cox was checked by a scratch force of Confederates led by Braxton Bragg. This victory has been credited with granting Joe Johnston the time needed to concentrate the remnants of the Confederacy's western armies and fight one of Sherman's wings at Bentonville. Sokolosky and Smith are an impressive writing team [their fine first book "No Such Army Since the Days of Julius Caesar": Sherman's Carolinas Campaign from Fayetteville to Averasboro, March 1865 is being reprinted by Savas Beatie in 2016] and this will undoubtedly prove to be the best treatment of this understudied battle. Long time readers might recall my review of a problematic earlier attempt The Battle of Wyse Fork (2008). In "To Prepare for Sherman's Coming" the authors's research delves deeply in archival and other primary sources and a great set of original maps has been prepared by George Skoch. Author Q & A: Kyle Sinisi on "The Last Hurrah: Sterling Price's Missouri Expedition of 1864"
Citadel history professor Kyle Sinisi's new book The Last Hurrah: Sterling Price's Missouri Expedition of 1864 was published this summer by Rowman & Littlefield. He is also the author of Sacred Debts: State Civil War Claims and American Federalism (2003) and co-editor of Warm Ashes: Issues in Southern History at the Dawn of the Twenty-First Century (2003). The Last Hurrah, a groundbreaking operational history of the Confederate campaign in Missouri in 1864, is the subject of this interview. DW: The staff at Fort Davidson has attempted to compile a list of names of those that fought with Price at some point during the 1864 Missouri Expedition. Considering the older consensus view that Price took 10-12,000 men into Missouri and that strength waxed and waned as men deserted and others were added (many forcibly), what they came up with is quite striking. Walter Busch is confident that the Confederate numbers swelled to 20-25,000 by the time of Westport. What are your thoughts on the subject? KS: The Fort Davidson list is among the more valuable data compilations that you can find in Civil War military history. All researchers on the war in the Trans-Mississippi are indebted to Walter Busch and his staff for the data base. That said, it is a list in need of careful interpretation and further cross-checking. The list includes all types of men who were not really attached to Price’s army. There are guerrillas tagged to leaders such as Quantrill and Anderson, and still many others who can only be identified as “guerrilla” or “irregular.” Others on the list include numerous members of isolated bands of recruits who either never made it to Price’s army or who only reached Price once he stopped his retreat at Laynesport. Large groups led by Eli Hodges and Salem Ford fit this category. Due to the variety of sources used and a lack of uniformity in nineteenth-century spelling and name initials, there are no doubt some repeated entries. However, I think the biggest issue to navigate with the list concerns when exactly these men entered or left Price’s army. For every entry that specifies, or hints, at a period of service, there are three or four entries where that service may not even coincide with the expedition let alone some portion of it. At the end of it all, I think there is every reason to believe that Price “enrolled” near to 20,000 men in the army. Given the desertion and straggling that afflicted the army, I think it unlikely that Price ever had 20,000 men in the ranks at any one time. Although the Fort Davidson list allows us to guess and estimate with a greater confidence, there is still a bunch of guessing and estimating taking place. DW: On the Confederate side, reaching the Missouri border at all (let alone untouched) was an achievement in itself and the result of enormous good fortune. Union general Frederick Steele is generally well regarded in the Civil War literature and was thought highly of by his contemporaries yet his complete failure to engage Price in Arkansas (either coming or going) when the Confederates were extremely vulnerable to interdiction represents one of the worst command performances of the war. Did you discover any reasonable explanation for this? Psychological speculation is always dangerous but do you think the near disaster of the earlier Camden Expedition contributed to his command paralysis? KS: Frederick Steele’s performance is one of the great mysteries of the campaign. I really have no deep explanation for why he allowed Price to roam freely through Arkansas either at the beginning or the end of the campaign. I simply think he was overwhelmed by the rush of events and a flood of different reports as to Price’s intentions and location. I also do not think he was well served by his subordinate commanders, especially Powell Clayton at Pine Bluff, in the scouting or pursuit of Price. Was Steele scarred by Camden? Possibly, but in the end I do not think he was suited for higher-level command and the risky decisions (and guesses) that came with it. He was a capable field commander, but he was overwhelmed when it came to commanding a far-flung department. DW: Do you believe that the contemporaneous uptick in guerrilla violence throughout Missouri during the summer of 1864 was more a function of coincidence or planned coordination with Price? KS: This is one of those issues that I address directly in the book. I do not believe there was any significant connection between Price and the guerrilla uprising. Although Price in early August did dispatch several couriers into Missouri in search of guerrilla leaders, there is scant evidence these couriers ever linked with the primary leaders. Indeed, there is only evidence that one courier, Jeremiah Moore, made contact with Quantrill on September 12. John Edwards, who was famous for inventing many parts of his historical narratives, claims that another courier made contact with George Todd on September 8. Assuming these stories are true, they nevertheless illustrate how Price could not have orchestrated guerrilla actions. The guerrilla uprising had started in June, three months before any of Price’s couriers could have relayed orders. I think the best explanation for the uprising, and its success, is that Missouri had been stripped of its Union manpower. By the summer of 1864, about 67 percent of the Department of the Missouri’s troops had been shipped east across the Missouri River. Missouri was relatively undefended, and the guerrillas knew it. DW: One of the most common criticisms of Price is that he overburdened his column with wagons and moved too slowly. However, most of this seems predicated on the false impression that the operation was conceived as a raid from the beginning. In your opinion, how much censure over the measured Confederate rate of movement is warranted? KS: I think the criticism of the trains and Price’s march speed is largely overblown. A summary starts with the fact that the whole expedition was not designed as some quick raid in and out of the state. Price was going there to stay, and he commanded an army that could not easily feed its men and horses along the route. Price needed a lot of wagons to carry the food, ordnance, and forage necessary to sustain that army. Price very much understood the importance of the trains based upon his experience in the Camden campaign against Frederick Steele. Price defeated Steele by destroying his support trains. With all of this in mind, Price then assembled his trains in accordance with Confederate regulations, which gave him about 250 wagons at the outset of the expedition. First-hand accounts of the size of the trains remained pretty constant throughout the expedition with one Union observer counting “about 250” in the vicinity of Lexington. Even if this particular account was off by two-hundred wagons, the reality is that by this time of the operation, Price needed more, not fewer, wagons. The size of his army had swelled to at least 17,000 men, and he needed a corresponding increase in his supply transport. While the wagons were ponderous and they did slow the advance of the army, of far greater importance in slowing the army were hundreds of dismounted men who walked among the trains. That number grew throughout the expedition as dismounted recruits and prisoners got added to the trains. One other thing slowing the march would have been the cattle in the trains that were absolutely vital to feeding the army. Jeff Thompson’s attack on Sedalia alone netted Price over 1,000 cattle. Price’s conduct of his march adhered to the standard procedures and regulations for cavalry during the war. He also issued an extraordinary set of orders at the outset of the campaign that sought to mitigate straggling and delays in the march. Nevertheless, the accumulated weight of the dismounted men, livestock, and wagons in the trains did slow Price’s march. Price exacerbated things with poor execution in the juggling of units on daily marches. Perhaps worst of all, Price waited far too long to jettison the bulk of the trains when it became obvious that his army was in jeopardy near to Kansas City. DW: If Price had moved faster do you think he could have captured St. Louis, or if not St. Louis then Jefferson City? KS: I don’t think any reasonably accelerated march would have resulted in the capture of St. Louis. Price’s rate of march through Arkansas and into southeast Missouri befitted an army with wagons, livestock, and hordes of dismounted men who walked along in the trains. Price really could not have traveled all that much faster without disintegrating the force before it even arrived at Pilot Knob. Regardless, there is perhaps an even more intriguing point to consider. Assuming the gods of war had smiled upon Price and allowed him to capture a very well defended St. Louis, there could be no reasonable expectation of holding the city for an extended period of time. There was simply too much Union combat power in the region. Price would have been quickly evicted or crushed had he chosen to stay at St. Louis. Jefferson City involves much the same consideration. Price most certainly lost a great deal of time in his march from Pilot Knob. The diversion of troops to chase Ewing slowed him down as did the pace of the main body as it moved toward the Missouri River. But at the same time, Price was in Missouri to foment a popular rebellion and add troops to his army of occupation. His pace through the state would be dictated not just by the number of dismounted men in his column, but also by the daily attempts to recruit large numbers of men and sort through captured prisoners and conscripts (most of whom were dismounted). A quick dash from Pilot Knob to Jefferson City was really not in the cards. Finally, and just as in the case of St. Louis, the question needs to be asked “so what”? If Price had indeed captured Jefferson City and moved Thomas C. Reynolds into the governor’s mansion, how long could he have held it and what would have been materially changed about the expedition? The capture would have no doubt sent shock waves through Missouri’s Union population and government. It may also have added more men to Price’s ranks. But in the end, Price could not have held the city for an extended period of time. Everything depended upon a massive uprising of Missouri’s population on behalf of the Confederacy. That simply was not going to happen. DW: Price’s opponent, Missouri Department commander William S. Rosecrans, is a controversial figure. How would you assess his response to the Confederate advance into Missouri? KS: Rosecrans faced three big problems in defending the Department of the Missouri. First, he had about 17,600 troops to defend the state. The bulk of his manpower had been transferred east. Second, no one important liked or trusted him. Edward Stanton, Henry Halleck, and Ulysses Grant all thought Rosecrans a nuisance who was prone to exaggerate the difficulties he faced. Rosecrans was thus a distrusted general commanding a department whose purpose was to provide men for other departments. Magnifying his problems, Rosecrans bought into the conspiracy theory of an uprising of the Order of American Knights, and he tried repeatedly to get all of Washington to see the looming danger in Missouri. This sort of thing made Grant, especially, even more dismissive of Rosecrans. Grant wanted to replace Rosecrans, and the commanding general did his best to insult him and then deny him the responsibility of actually dealing with Price. Grant even had Halleck give A.J. Smith the “problem of catching Price,” and Halleck thus instructed Smith to operate independently of Rosecrans if necessary. Fortunately for the Union, Smith deferred immediately to Rosecrans and his orders. The third big problem Rosecrans faced concerned information regarding Price’s movements. Frederick Steele failed terribly in this regard, and Rosecrans was left to guess where Price would enter the state all the while carefully husbanding scarce manpower. Given all of these issues, Rosecrans did about as well as anyone could have expected right up until the point where Price reached Jefferson City. Thereafter, Rosecrans lost tactical control of his pursuit forces. He was forever displaced too far to the rear and unable to react to changing developments and new reports. By October 21, Alfred Pleasonton was too detached from Rosecrans’s actual tactical control, and the cavalryman presented Rosecrans with a fait accompli when he engaged Price. Pleasonton was thus in no position to pull out or dispatch a part of his force to block Price to the southwest. A.J. Smith’s infantry got caught up in this commitment to battle in the vicinity of Kansas City as Rosecrans now ordered it to try and support Pleasonton. Perfect hindsight lets us imagine that Smith could have been better used in a march south toward the Kansas-Missouri border where he could have blocked Price’s escape or at least altered it to the advantage of the Union. DW: Given the qualitative unevenness and gaps in coverage in the literature of the expedition it’s problematic to say that a master narrative even exists. Even so, enough has been written to form some degree of consensus on key aspects of the operation. In the introduction to your book you mention that your study revises the traditional history of the campaign in many different ways. Can you briefly talk about two or three examples? KS: Yes, there are quite a few things that could be mentioned here. The first would have to concern Price’s intentions for the expedition. He desired the conquest of Missouri and anticipated a popular uprising that never came. To label the expedition a raid distorts what Price intended to do from the outset. Among some of the other conclusions is that Price’s defeat at Pilot Knob was not nearly as debilitating as we generally think. The casualty figures were fairly low as a percentage of his army, and his turn from St. Louis really had nothing to do with the defeat. The reassessments of the size of Price’s trains and his rate of travel are important. But if given only two other things to mention, I would go with the maps and the study of the expedition’s aftermath. Although there have been some excellent maps produced on Pilot Knob, we really have been stuck with some map interpretations that have repeated errors since the campaign itself. I have tried to correct the errors as well as provide maps for various parts of the expedition that have heretofore been missing, especially in marking the passage of the various forces in between the major engagements. As to the aftermath, I think you get a better sense of the impact of the expedition by looking at what happened after the shooting stopped. Here you can chronicle the attempts of up to 2,000 men who chased after Price trying to join his army while that very same army disintegrated due to exposure, disease, desertion, and starvation. Another important facet of the aftermath concerned the treatment of Confederate prisoners. In a war where the average mortality of Confederate prisoners stood at 12 percent, over 30 percent of Price’s men died in the Union camps within just five months. Yet another aspect of the aftermath relates to how Union authorities dealt with the hundreds of men who claimed to have been conscripted at gun point into Price’s army. Needless to say, Union authorities were not very trusting of such stories, which then meant that more men were incarcerated and proceedings had to be instituted to determine the loyalty of all those caught up in the path of Price’s army. One final part of the expedition’s aftermath that has not really received all that much attention down through the years was the return march of Union forces through Arkansas and Missouri. Things did not go well for the citizenry as the men of Frederick Benteen’s and Doc Jennison’s commands created a swath of destruction that typified the carnage of the border war. For as much as Sterling Price, Samuel Curtis, and several other subordinate commanders tried to restrain their soldiers, the learned savagery of the border wars could not be eliminated by well-meaning senior commanders. DW: In terms of numbers present, the multi-day conflict around Westport (arguably?) comprised the largest Civil War battle fought west of the Mississippi yet until your book came around the fullest available treatment remained Howard Monnett’s dated Centennial monograph. You cover Westport in some detail. Did your research lead you to conclude that we need to reassess the battle in any fundamentally different way(s)? KS: Howard Monnett’s book has been the standard history of Westport for quite a while. However, it is time for a fresher look. Some of this fresher look has to do with emphasizing how poor, or at least defective, Union cartography shaped the battle and its historiography. Some of the Union maps failed to label properly the various fords across the Big Blue. One consequence was that on October 22 a significant ford, Hinkle’s, was left completely unguarded when Thomas Moonlight took his brigade to another ford he thought was Hinkle’s. Shelby readily exploited this error, and he pushed troops across the Big Blue at Hinkle’s and yet another ford further to the south. Curtis’s line then collapsed as a result. Battlefield cartography has also been terribly muddled as it regards the passage of Price’s trains through the battle area and John McNeil’s lost opportunity to destroy them on October 23. I think The Last Hurrah helps to clarify the path of the trains and the location of the McNeil’s aborted attack at what was known as Hart Grove Creek. Of great help in revising the story of the trains, and McNeil’s problems, were Union courts martial records. These records also allow a much more detailed study of the Union attack at Byram’s Ford and help reveal the misunderstandings and confusion that led to Alfred Pleasonton’s sacking of James McFerran and Egbert Brown. The courts martial records, and other materials, facilitate an evaluation of the combat performance of the Missouri State Militia in comparison to Edward Winslow’s brigade of volunteer cavalry at Byram’s Ford. There are some other new insights about the battles around Kansas City, especially in the book’s coverage of the actions at Rock Creek and the Mockbee Farm on the 22nd and at Brush Creek on the 23rd. However, I think one of the fundamental reassessments of the battles has to do with casualties. Historians have badly inflated the total casualty figures that range as high as 5,300 for both sides for the period from October 21-23. Howard Monnett claimed 1,500 casualties on October 23 alone. I think the evidence points to a much smaller figure, especially for October 23, where there were no more than 800 total casualties. My sense of the casualty counting is that ongoing research may well prove the number is even lower. This downward revision of casualties begs the question of why the battle was less bloody than we have long thought. Here I try to look at the marksmanship of both sides in light of Earl Hess’s studies. In the end, I think the armies were filled with men, especially on the Union side, who did not have the training to maximize the effectiveness of their weapons. They were, in other words, typical soldiers for the war. DW: Looking back, it surely strikes most modern observers that the campaign was foolhardy at best, with the Confederates needing a heavy dose of good luck just to survive. After finishing your project and knowing what we know now, what was Price’s best case scenario for his Missouri expedition? KS: Price’s best case scenario was essentially what happened in fact. Price intended to redeem the state for the Confederacy. It had been his sole focus, and that of Missouri’s exiled Confederates, ever since Price had been expelled in 1861. For Price to retake the state he needed not only military victories, but for Missouri’s population to rise in a popular revolt against Yankee rule. Price’s passage through Missouri netted him in the vicinity of 8,000 recruits. This was far below the tens of thousands of men that Price and his followers believed represented the true sentiments of Missouri. Given then a people who did not want to be liberated, it was inevitable that his expedition would deteriorate into what looked like a raid. Ultimately, the best, and most realistic, course of events for Price would have been victory at Pilot Knob and then a march through the heart of the state much as actually took place. A victory at Pilot Knob would have provided a morale boost to Price and his Missouri Confederates. It may have bolstered recruiting. It may also have further diverted troops from the eastern side of the Mississippi River. However, none of these things would have altered his stay in Missouri or the larger course of events during the war. In the end, Price’s biggest mistake was to loiter too long in the Boonslick and to not turn south at Lexington, which provided him his best (albeit slim) chance of escape. In that way, he could have possibly preserved his army and any of the men or material he garnered along the way. DW: Some writers have suggested that Price’s campaign in Missouri significantly prolonged the war (by some estimates, up to two months). What is your view on the strategic outcome of the operation? KS: I would not agree. The argument for the prolongation of the war is usually that Union troops earmarked to participate in either the attack upon Mobile or Sherman’s March to the Sea were diverted to fight Price. The diversions thus delayed the actions, and the war was prolonged. A corollary might be that Price’s Expedition so concerned the Union command structure that it also served to delay Sherman’s March. For Mobile, a plan existed to begin an attack in November 1864. It was indeed delayed until April 1865. Although the attack may have been delayed because of a diversion of troops to combat Price (and I am not convinced the delay was because of this), the whole argument is largely irrelevant. For all of Mobile’s importance early in the war, by the beginning of Price’s Expedition the city had little strategic value for the Confederacy. Farragut’s victory at Mobile Bay made sure of that. Not a single blockade runner had entered or exited the city since July. The city was strategically insignificant without a viable port. Farragut’s victory prompted Grant to say, “We have all of Mobile that is valuable.” The loss of the city may well have been the final nail in the coffin of the Confederacy in April 1865, but the cover on the coffin had been securely in place since July and August 1864. As to Sherman’s March, the chronology of events does not support Price’s Expedition delaying anything. Atlanta fell September 2. Sherman then took several weeks to restructure his force, deal with civilians and prisoners, and plot his next move. What concerned Sherman most was not Sterling Price but logistics as he wrestled with what to do next. Once Sherman settled on his objective, Savannah, he waited for two things to finish before he marched the army. As Anne Bailey has written in her book, War and Ruin, those two things were the results of the November presidential election and for the rains to cease in Georgia. Plainly, Sherman’s actions were not controlled by Price’s Expedition. One final point to make is that any continuation of the war past April 1865 depended entirely upon the ability of Robert E. Lee to extract his army from Petersburg and then to link with Joe Johnston somewhere in North Carolina. Nothing Sterling Price did in Missouri, or the Union’s reaction to Price, was going to affect this. DW: That was a great discussion. Thank you for participating in this author Q&A and, even more, for being the one to finally fill a 150 year old gaping hole in the military historiography of Missouri’s Civil War. 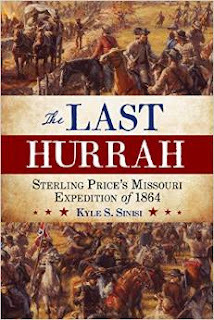 Again, the book title is The Last Hurrah: Sterling Price's Missouri Expedition of 1864 and, readers, you can also find my review here. 1. Cold Harbor to the Crater: The End of the Overland Campaign edited by Gary W. Gallagher and Caroline E. Janney (UNC Pr, 2015). Cold Harbor to the Crater is the decade dormant rebooting of the venerable Military Campaigns of the Civil War series, which retains the eastern theater exclusivity and adds Janney as co-editor. "The contributors [in addition to the editors, Keith Bohannon, Stephen Cushman, Keith Harris, Robert E.L. Krick, Kevin Levin, Kathryn Shively Meier, Gordon Rhea, and Joan Waugh] assess the campaign from a variety of perspectives, examining strategy and tactics, the performances of key commanders on each side, the centrality of field fortifications, political repercussions in the United States and the Confederacy, the experiences of civilians caught in the path of the armies, and how the famous battle of the Crater has resonated in historical memory." Now that the series has been revived, plans are underway for continuing on to Appomattox in the next volume and then backtracking to previously passed over First and Second Bull Run. 2. The Chickamauga Campaign - Glory or the Grave: The Breakthrough, the Union Collapse, and the Defense of Horseshoe Ridge, September 20, 1863 by David A. Powell (Savas Beatie, 2015). Poor David. From the look of this one, he can expect more trenchant reader review comments like "focuses on minutiae", the book has "(t)oo much detail, too many names to keep track of", "very difficult to follow. It reads almost like a textbook" and "reader must memorise dozens of names AND which side they were on." Not from me, though. For those that can appreciate the sum total of an adult lifetime of research and its end product of sprawling definitiveness, this trilogy is for you. The Glory or the Grave narrative ends at page 708 before going right to the index, so (as the author has stated in numerous places) readers looking for a full bibliography and more supplementary material will have to await the third and final volume. Civil War Books and Authors turned 10 earlier this month. It was definitely a different time back in 2005. Twitter didn't exist and Facebook was founded only the previous year. Blogging was a thing already but Civil War blogging certainly wasn't a popular pursuit. The really dedicated writers collectively could be counted on two hands with fingers to spare and there was a great deal of direct interaction between them. Like all things do, this changed over time. I liken it to freshman year dorm life when everyone worked and played together in the early glow of excitement before gradually striking out on their own individually or in small groups by the end of the second semester. Way back when, the average blog lifespan was estimated at only two months (like that of a new flyer on the Western Front in 1917). CWBA didn't quite turn out as intended, instead morphing rapidly into a full on review journal, a situation which I am obviously fine with as I've been doing it for a decade. Since it has been and always will be a one-man operation, the website is by necessity a curated platform and it is my earnest hope that readers feel it original enough in content and emphasis to both keep on board current visitors and attract new ones. The work vs. fun factor has sometimes lingered uncomfortably close to the former category but, after all this time, I still feel the passion when it comes to our little corner of the historical publishing world and certainly plan to continue on with the discussion into the foreseeable future. Sinisi: "THE LAST HURRAH: Sterling Price's Missouri Expedition of 1864"
With Confederate General Sterling Price's mounted Army of Missouri traveling nearly 1,500 miles through Arkansas, Missouri, Kansas, and Indian Territory and fighting over a dozen battles and countless other skirmishes in the course of being utterly defeated, it is a marvel that no one has written a competent full-length military history of this fascinating campaign of epic sweep until now. This seemingly quixotic late war adventure hasn't been entirely neglected in the literature, though. A command study and a two-volume social and political history1 have been written, as have a number of books and articles detailing some of the battles fought. While the climactic clash of the campaign, the October 21-23 Battle of Westport, still lacks a dedicated modern military study2, two fine books examine perhaps the operation's most well known engagement at Pilot Knob3. Citadel history professor Kyle Sinisi's The Last Hurrah: Sterling Price's Missouri Expedition of 1864 is the first comprehensive operational study of the entire campaign. The Last Hurrah effectively recounts the campaign from inception to conclusion. Near the end of summer 1864, Sterling Price would finally get his grand opportunity to try to wrest control of his home state from federal forces. On September 6, Price and two divisions made an unopposed crossing of the Arkansas River and linked up with a third division under General Jo Shelby in NE Arkansas. While indifferently armed and equipped, all three divisions were mounted. On September 27, the Confederates surrounded and assaulted Union-held Fort Davidson in SE Missouri's Arcadia Valley, suffering a bloody repulse and, adding insult to injury, allowing the enemy garrison to escape during the night. Giving up the cherished goal of capturing St. Louis, Price veered toward the state capital of Jefferson City but federal reinforcements secured the fortified town before the Confederates arrived. At this point, the operation transformed from a war of conquest and occupation to a more traditional raid. As Price moved his army up the Missouri River Valley, capturing important towns like Boonville, Glasgow, and Lexington along the way and gathering both recruits and supplies, Union forces bent on his destruction were converging on Price's front and rear. Missouri Department commander William Rosecrans placed ex-Army of the Potomac cavalry chief Alfred Pleasonton in charge of a provisional division of four mounted brigades and sent him against the tail of Price's wide column. Meanwhile, along the Missouri-Kansas border, Department of Kansas head Samuel Curtis was assembling a large combined host of volunteers and Kansas State Militia. In a series of late October engagements at Independence, the Little and Big Blue rivers, and on the plain just south of Westport, Curtis and Pleasonton completely defeated Price and sent the Army of Missouri reeling into headlong retreat. Catching up with Price in eastern Kansas, the Union vanguard nearly destroyed the Confederates at Mine Creek, rendering impossible Confederate hopes of capturing the desperately needed supplies stored at Fort Scott. The final stand up fight of the campaign, a tactical draw at Newtonia in SW Missouri on October 28, nevertheless forced Price into another rapid retreat, this time a tortuous journey through NW Arkansas, the Indian Territory, and back to SW Arkansas at Laynesport on December 2. After casualties, desertions, and wholesale furloughs, only 3,500 of the original 10-12,000 Confederates were left in the ranks. Sinisi's assessment of Sterling Price's many flaws as army leader is far more nuanced than the one passed down through history. The author agrees with Price's critics that deem the Missourian an indifferent planner and disciplinarian as well as a poor battlefield commander but Sinisi recognizes that Price operated under many physical and material constraints. Uniquely limited Trans-Mississippi logistics meant that Price's horses (for men and wagons) would never be in top condition and, at this late stage of war, obtaining mass replacements while on the march were out of the question. With the army afforded no time to coalesce as a unit and packed with green recruits forcibly added to the ranks along with large numbers of men used to operating as lawless guerrillas, enforcing regular discipline in the Army of Missouri would have taxed the best leader's abilities. While Price did move too slowly at inopportune times, observers that generally and vehemently condemn the popular Missourian for moving at the speed of infantry throughout most of the campaign fail to appreciate that the campaign was not originally conceived as a raid. Price has also been generally mocked for the immense size of the Confederate wagon train, generally presumed to have been loaded down with loot, and his sustained efforts to preserve it. Sinisi finds no evidence that the train was inordinately large in size (more like 250 wagons vs. 600). In terms of shoulder arms and artillery, the Army of Missouri was very poorly equipped and thousands were without weapons entirely. With only a few brigades in the army able to fight effectively, it's noteworthy that the Confederates were able to achieve any battlefield success at all. Price also lacked critical support from his immediate superior, Trans-Mississippi Department commander Edmund Kirby Smith, who did nothing to aid either the launch of Price's campaign or its return march. It seems miraculous that Price's army should have escaped destruction, but, as Sinisi demonstrates in the book, this was largely a consequence of the Union army's divided command structure and key blunders. The Union commander in Arkansas, General Frederick Steele, made no attempt to quash the Confederate campaign in its infancy. Instead, he allowed Price to cross the Arkansas River and meet up with Shelby in the northeast corner of the state unopposed. Compounding this dereliction of duty, Steele also failed to gather any intelligence as to Confederate movements and forward them to Rosecrans in Missouri. Finally, he did nothing to hinder Price's retreat back into Arkansas when the Confederates were in desperate straits. In all aspects, it was an abysmal command performance. Lacking information, Rosecrans was slow to react to Price's invasion and nearly lost the state capital in the process. He recovered, though, and assembled a powerful striking force to operate against the rear of the Confederate army as it moved west across Missouri. In Kansas, Curtis dealt rather ineptly with the state's fiercely partisan Republican political factions and was too deferential in his dealings with troops from Rosecrans's department. In the middle of the pursuit down the Kansas-Missouri border, Pleasonton, who otherwise aggressively chased Price across Missouri, inexplicably decided to declare victory and end his command's role in the campaign. By the time Curtis was able to get the pursuit back in high gear, the Confederates escaped. Even though Union victory was clear cut it was incomplete and the failure of Washington to provide for a unified command at any point during the three month operation bore bitter fruit. Covering such a vast campaign in a single volume of reasonable size is a difficult proposition but Sinisi's efforts toward maximizing available space succeed admirably. His description and analysis of the Missouri Expedition in all three major military dimensions — strategic, operational and tactical — are appropriately weighted and balanced. For a work of this scale the amount of tactical detail provided for the many battles and skirmishes fought is more than satisfactory. The roughly one hundred pages devoted to the October 19-23 series of battles fought just east and south of Kansas City comprise the best treatment yet of what one might consider collectively as the Battle of Westport. In support of the narrative is a very useful set of 21 maps created by Larry Hoffman. In general terms, the cartography of the Missouri Expedition is scant and woeful in the collective literature and The Last Hurrah goes a long way toward rectifying this deficiency. The somewhat complex movements and side-movements of Price's army are clearly traced on the book's operational scale maps and the many tactical maps correlate well with the text descriptions of the unit and landscape battlefield tableau associated with each one. Research is heavily weighted toward primary sources and the author consulted a bevy of manuscript collections located all over the country. Revisions both large and small to the traditional story of the campaign abound. Some of these have already been noted above but just a few additional examples involve the question of how much Pilot Knob really debilitated Price's army, an original interpretation of the path of Price's wagon train on the retreat from the Westport battlefield, post-battle atrocities, and the extremely high mortality rates among Confederate POWs that survived initial capture. Indeed, while both sides killed civilians and captured soldiers during the campaign (especially along the Kansas-Missouri borderlands), Confederates scooped up during the retreat had a high likelihood of being summarily shot. Detailed inquiry into the latter is beyond the scope of this particular volume but historians would do well in future to widen their net around the general subject of Civil War atrocities and better explore other incidents deserving of further study alongside those associated with racial violence. As one might expect, the book also accepts many of the traditional interpretations of the campaign. Some remain questionable. For example, the author assumes, as have many others before him, that Confederate artillery would have shelled the Union defenders out of Fort Davidson if only Price had had the patience to do it; however, the notion seems open to question and even doubt given how roughly the Confederate guns that were deployed on the high ground during the battle were handled by Union siege guns mounted in the fort. Nothing should be regarded as a serious deal breaker but there are a few unfortunate issues related to the book's presentation. Typographical errors are frequently encountered in the text and some expected features of military studies of this type (e.g. detailed orders of battle and useful supplementary data like unit strength/casualty tables) are absent. For students of the Civil War in Missouri, The Last Hurrah: Sterling Price's Missouri Expedition of 1864 has been well worth the considerable wait. The first thorough military treatment of the campaign, this deeply researched and skillfully composed study also holds the added distinction of ranking among the finer examples of Civil War operational military history regardless of subject. Highly recommended. 1 - Michael J. Forsyth's The Great Missouri Raid: Sterling Price and the Last Major Confederate Campaign in Northern Territory (2015) and Mark Lause's Price's Lost Campaign: The 1864 Invasion of Missouri (2011) along with it's perpetually delayed companion The Collapse of Price's Raid: The Beginning of the End in Civil War Missouri (2015?). 2 - A handful of Westport studies exist, but the standard account is Howard N. Monnett's dated Action Before Westport, 1864 (1964), which was lightly revised by the author's son, historian John M. Monnett, in 1995 and re-issued by the University Press of Colorado. Fred Lee's The Battle of Westport, October 21–23, 1864 (1976 and 1996) is another important book. 3 - Where Valor and Devotion Met: The Battle of Pilot Knob by Douglas Gifford (2014) and the recently revised and expanded edition of Bryce Suderow's 1986 classic Thunder in Arcadia Valley: Price's Defeat, September 27, 1864, retitled The Battle of Pilot Knob: Thunder in Arcadia Valley and co-authored with R. Scott House (2014). Both are thorough histories of the Pilot Knob battle along with the initial stages of the campaign as a whole. Operating at peak output back in the 1980s, historian James Lee McDonough has authored an extensive series of western theater Civil War military studies over his long writing career, to include major works on the battles of Shiloh, Stones River, Chattanooga, Franklin and Nashville (as well as an overview history of the 1862 Kentucky Campaign). While these were fairly well regarded at the time, most have nevertheless been significantly superseded by new works published from the 90s onward. In 2016, W.W. Norton will publish McDonough's Sherman biography titled William Tecumseh Sherman: In the Service of My Country: A Life. No details as of yet but it will apparently come in at a doorstopper size of 832 pages (and the faux pas of having two colons in the title will presumably be rectified at a later date). 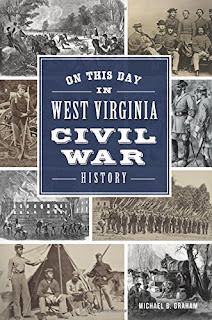 Graham: "ON THIS DAY IN WEST VIRGINIA CIVIL WAR HISTORY"
As the title suggests, On This Day in West Virginia Civil War History discusses a historical event associated with each day of the calendar year (not be confused with a day by day accounting of the entire war). Military actions dominate the entries but political occasions related to the region's divisions and ultimate break from Virginia to form an entirely new state are also sprinkled about. Length varies greatly and runs from a single sentence to a maximum of around 250 words, and for the latter the author is generally effective at packing as much 'who-what-where-when-why' information as possible into the limited space available. Author Michael Graham does a fine job of evenly selecting events from each year of the war. Readers that might believe that little happened in trans-Appalachian Virginia after Union forces seized control of the region in 1861 will find themselves quickly disabused of the notion. Graham also conveys the full range of violent activities that defined the war in West(ern) Virginia, from regular campaigns to cavalry raids and guerrilla/counter-guerrilla actions. Militarily, West Virginia's inner war was similar to that of other Border States. Appropriate thought was also put into geographical spread, with historical events from all corners of the state included in the book. There are no maps in the volume [at the very least, a single county and city/town overview map would have been helpful] but photographs are relatively abundant. Footnotes are absent but the bibliography indicates that a broad range of source materials were used. In addition to the O.R. and other government documents and publications, many books (including a nice selection of published firsthand accounts, biographies, battle histories, and unit studies), articles, newspapers, and periodicals were consulted. Manuscript collections and other unpublished resources are also listed in the bibliography. Designed to be consumed in short bits, the book's content arrangement serves as a nice introductory aid for historically inclined West Virginia readers of today. No matter where they live in the state, something is bound to attract their interest and hopefully inspire them to delve deeper into the many facets of West Virginia's rather underappreciated Civil War history. 1. Health of the Seventh Cavalry: A Medical History edited by P. Willey and Douglas D. Scott (Univ of Okla Pr, 2015). Willey and Scott scour the medical records of the famed 7th Cavalry to examine which ailments were common to the U.S. Army of the time and how they were treated. Taken together, their findings offer readers a general picture of the health of army units that fought in the post-Civil War West. "Pairing general overviews of nineteenth- and twentieth-century health care with essays on malaria, injuries, post-traumatic stress disorder, and other specific ailments, Health of the Seventh Cavalry provides fresh insights into the health, disease, and trauma that the regiment experienced over two decades. More than 100 tables, graphs, and maps track the troops’ illnesses and diseases by month, season, year, and location, as well as their stress periods, desertions, and deaths." 2. Confederate Saboteurs: Building the Hunley and Other Secret Weapons of the Civil War by Mark K. Ragan (TAMU Press, 2015). The Hunley is an oft written about subject but it is just one of many weapons developed by the Singer Secret Service Corps out of Texas, their output of death dealing devices including many types of contact mines, railroad mines, and torpedo boats in addition to submarines. Ragan's book details the activities of the government funded Singer group and it looks like a fascinating window into Confederate special weapons technology. 3. Lincoln and the Thirteenth Amendment by Christian G. Samito (SIUP, 2015). This is the latest volume from Southern Illinois's Concise Lincoln Library series. In it "Christian G. Samito examines how Lincoln’s opposition to amending the United States Constitution shaped his political views before he became president, and how constitutional arguments overcame Lincoln’s objections, turning him into a supporter of the Thirteenth Amendment by 1864." He "relates how Lincoln made the amendment an issue in his 1864 reelection campaign, chronicles lobbying efforts and the final vote in the House on the amendment resolution, and interrogates various charges of corruption and back-room deals. He also considers the Thirteenth Amendment in the context of the Hampton Roads conference, Lincoln’s own thoughts on the meaning of the amendment, and the impact of Lincoln’s assassination on the reading of the amendment." 1. The 11th North Carolina Infantry in the Civil War: A History and Roster by William Thomas Venner (McFarland, 2015). Venner is also the author of a regimental study of the 7th Tennessee . Like that unit, the 11th North Carolina served in the eastern theater with the Army of Northern Virginia. The two books are are also similar in style and format. There is substantial archival research, numerous and nice looking maps, and a well organized casualty list and unit roster to go along with a more than sufficiently detailed military narrative. 2. North Carolina Civil War Obituaries, Regiments 1 Through 46: A Collection of Tributes to the War Dead and Veterans compiled and ed. by E.B. Munson (McFarland, 2015). Munson has gathered together for publication an impressive number of newspaper obituaries for soldiers from the First through Forty-sixth regiments of North Carolina Troops, which included infantry, cavalry and artillery units. "This compilation of obituaries from North Carolina newspapers documents the date and cause of death for hundreds of soldiers, with many providing place of burial, surviving relatives, last words, accounts by comrades and details of military service." One can imagine that this book would be a must-buy for those conducting serious research into North Carolina regiments and soldiers. 3. The Battle of Roanoke Island: Burnside and the Fight for North Carolina by Michael P. Zatarga (The Hist Pr, 2015). For years, the History Press (now Arcadia Publishing and The History Press) has been publishing small, focused studies on various aspects of the 1861-62 Union combined operations conducted along the North Carolina coastline and most have been quite worthwhile. The initial impression of Zatarga's book is that it offers a fairly detailed account of the Roanoke Island battle, with pretty good maps. Browning: "LINCOLN'S TRIDENT: The West Gulf Blockading Squadron during the Civil War"
The naval history of the Civil War has long been a popular avenue for serious study by professional historians and enthusiasts alike and the resulting body of literature ranges deep and wide. Numerous single volume histories of the Civil War afloat have been written, as have a solid collection of ship profiles, blockade and foreign relation studies, industry and design/technology investigations, battle and campaign histories, and officer biographies. Firsthand accounts have also been published, although at a pace and scale far less than that associated with the army participants of both sides. In recent years, some of the most valuable contributions to the naval bookshelf have been authored by U.S. Coast Guard chief historian Robert Browning, whose Union blockading squadron studies remain unmatched in magnitude of research and content. Each new release in his series is a significant event in Civil War publishing and Browning's newest book, Lincoln's Trident: The West Gulf Blockading Squadron during the Civil War, is more than the qualitative equal of its North and South Atlantic squadron predecessors*. The research that went into Lincoln's Trident is broad ranging with a heavy emphasis on primary sources, especially manuscript resources and navy records. All of this went into crafting a remarkably expansive historical narrative. Over five hundred pages are devoted to every conceivable aspect of the men, ships, and operations of the West Gulf Blockading Squadron. In addition to describing major battles fought at New Orleans, Vicksburg, Port Hudson, Galveston, Sabine Pass, and Mobile, Browning packs into his book a seemingly exhaustive series of accounts detailing smaller naval engagements of all types, including ship vs. ship duels, ship vs. shore bombardments, contested fort passages, shore raids, and all manner of operations in support of the Union army. The geographical area covered is immense, from Pensacola, Florida all the way west to the mouth of the Rio Grande River (and all the bays and inland rivers in between). Devoting significant attention as well to Confederate plans and perspectives, these accounts are fully fleshed out, in many cases rivaling those found in specialized histories. Shipboard life on blockading vessels is also discussed in the book as are many of the blockade's economic and international political dimensions. While the human focus is understandably centered on the famous figure of David Glasgow Farragut, who led the squadron through most of the war, the book also draws needed attention toward many ranking Union naval officers of ability and distinction that have been largely overlooked, men like Henry Thatcher, Henry Bell, James Alden and many others. The command portrait of Farragut painted by the author is broadly in line with convention. If there was any single necessary man it was Farragut, who was highly aggressive, tactically sound, single minded in purpose, and determined to lead from the front. The native southerner also proved a strong judge of character when it came to selecting subordinates for commanding blockade stations, although his criticisms of many of those same officers sometimes seemed unfair, especially when judged from afar. In terms of command faults, Browning does note that Farragut developed a reputation in some quarters for being a poor administrator but the author doesn't delve into the substance of the charge much himself. Given its status as the farthest blockading station from northern ports (by far), it's not surprising that logistics became a major concern for the West Gulf Blockading Squadron and Browning devotes a great deal of attention to the matter. Adequate supply and coaling supports were built up at an exasperatingly measured pace and, with Navy Department priorities seemingly always directed elsewhere, steam powered ships numerous enough to cover the major ports and fast enough to overtake blockade runners were always in short supply. The failure to hold Galveston after its capture in 1862 also meant that logistics would always be stretched along the Texas coast, so much so that the squadron was often forced to rely upon sailing ships. Coaling at sea was problematic and New Orleans and Pensacola were too far away to repair and coal steamers without taking the vessels assigned to Texas off station for unacceptably long periods of time. Browning astutely observes, and argues persuasively throughout the book, that army-navy cooperation excelled on the tactical and operational levels but failed badly at the strategic level. Farragut and his officers worked harmoniously with Gulf Department army commanders Benjamin Butler and Nathaniel Banks but the cabinet heads of the army and navy together with the chief executive never developed any joint strategies in the Gulf. This oversight was far from inconsequential, as events at Vicksburg and especially Galveston would demonstrate. Also, the navy was prepared to attack Mobile at several points during the war only to have each prospective campaign derailed by shifting army priorities. Galveston offered the clearest and most appalling example of how useless it was for the navy to capture key points if army resources were absent or insufficient to hold the gains. The navy could also be the author of its own problems, its overarching obsession with Charleston keeping Confederate Mobile active far longer than the port city had any reason to expect. Union ironclads were kept from joining Farragut's fleet off Mobile Bay until the middle of summer 1864. Within the navy command structure, there was also a constant push and pull between tightening up the blockade and supporting offensive operations up the Mississippi River and other inland Gulf waterways. Contrary to the oft voiced expectations of Navy Secretary Gideon Welles, resources were never adequate for both initiatives and the blockade often suffered. Shallow draft steamers were also in such short supply to the Gulf squadron that Confederate sailing vessels could carry on coastal trade and penetrate the blockade with near impunity. There are some wish list items missing from the volume. Near the front of the book is a collection of area maps tracing the southern Gulf coastline and identifying the major forts and ports targeted by the Union navy. While these are fine tools for general reader orientation, the narrative describes the squadron's operations in great detail and there are no maps to accompany the chapters covering fleet battles, ship vs. shore engagements, and key fort passages. Many of these naval actions documented in Lincoln's Trident could be quite involved and consequently difficult to visualize without the aid of tactical scale maps. Supplementary reference information that one might expect from comprehensive studies of this type, such as lists of officers, squadron vessels and enemy ship captures, are also absent. Finally, while the final chapter provides a solid summary of the achievements, failures, and challenges of the West Gulf Blockading squadron, it does seem a bit rushed in marking out its conclusions, especially in its assessment of blockade effectiveness. On the other hand, Browning's study is primarily operational in nature and works analyzing the blockade do already exist. In the end, the book's immense strengths far outweigh any complaints. Browning's exhaustive and original squadron study is a clear front-runner for the best Civil War naval study of 2015. * - From Cape Charles to Cape Fear: The North Atlantic Blockading Squadron during the Civil War (Univ of Alabama Pr, 1993) and Success Is All That Was Expected: The South Atlantic Blockading Squadron During the Civil War (Brassey's, 2002). 1. A Civil War History of the New Mexico Volunteers and Militia by Jerry D. Thompson (Univ of NM Pr, 2015). At nearly 1,000 pages this book could beat up the Oxford English Dictionary. In addition to offering unit histories of the 1st and 2nd New Mexico Volunteer Infantry (both of which played important roles in the 1861-62 New Mexico Campaign that constitutes a major focus of the book), Thompson's book also studies a third volunteer regiment of mounted infantry and part of another New Mexico regiment. The volume also covers the Southwest US campaigns against the Apache and Navajo as well as the Battle of Adobe Walls fought in 1864 against a combined force of Kiowas and Comanches. Among the numerous appendices are unit rosters. 2. Lincoln's Final Hours: Conspiracy, Terror, and the Assassination of America's Greatest President by Kathryn Canavan (Univ Pr of KY, 2015). From the publisher's description: "this fast-paced account not only furnishes a glimpse into John Wilkes Booth's personal and political motivations but also illuminates the stories of ordinary people whose lives were changed forever by the assassination." ... "Through her careful narration of the twists of fate that placed the president in harm's way, of the plotting conversations Booth had with his accomplices, and of the immediate aftermath of the assassination, Canavan illustrates how the experiences of a single night changed the course of history." I just finished listening to the season opening episode of the CWTR podcast, which discussed Kent Masterson Brown's Retreat from Gettysburg: Lee, Logistics, and the Gettysburg Campaign. During the interview Brown mentioned that his next work will revisit the retreat from Gettysburg but this time from the perspective of the Union pursuers, with the primary focus being on the generalship of George Meade. The publisher will be UNC Press. Cooper: "THE BRAVE MEN OF COMPANY A : The Forty-First Ohio Volunteer Infantry"
In sheer numbers published, the Civil War company history lags far behind both regimental and brigade studies. However, with the company being the unit most intimately associated with specific counties and towns, the increased scholarly attention paid to the local dimensions of Civil War history may alter this pattern. The men of Company A of the 41st Ohio Volunteer Infantry hailed from three Buckeye counties (Cuyahoga, Portage, and Trumbull) and their story is the subject of Edward Cooper’s The Brave Men of Company A. With West Pointer William B. Hazen heading the regiment and Emerson Opdycke as First Lieutenant of Company A, the men were fortunate to be led by two future stars of the Union Army. After the incompetent and inefficient officers were weeded out, it wasn’t long before the regiment was well trained and ready for operations in the field. At the beginning of its service, Company A and the 41st pulled anti-guerrilla duty along the Ohio River front in western Virginia. They also fought at Shiloh, Stones River, and Chickamauga. As part of Hazen’s brigade, they helped defend the famous Round Forest position at Stones River, repelling Confederate frontal attacks throughout the first day of battle. After the Stones River fighting ended members of the company helped erect the first Civil War battlefield monument there. During the 1863 Chattanooga siege the men of Company A helped seize Brown’s Ferry, their success there widening the supply line to the beleaguered Union garrison. During the battle that finally broke the siege, the Ohioans advanced in the center to Orchard Knob and participated in the mass frontal assault that captured Missionary Ridge and forced the Confederate army to retreat into Georgia. In anticipation of the 1864 expiration of their three-year volunteer enlistments, the entire company took advantage of furlough and financial incentives and reenlisted. During the ensuing Atlanta Campaign the regiment suffered terrible losses at the Pickett’s Mill debacle. The 41st's last significant action occurred during the Battle of Nashville when Company A and their comrades successfully assaulted Overton Hill. Though they nearly mutinied at the prospect of being transferred to the U.S.-Mexican border, the men would sit out the rest of the war in Texas before returning home to resume their civilian lives. The fact that the company was not an independent maneuver element on the mid-19th century linear battlefield may partly explain the general author preference for regimental studies over company histories. 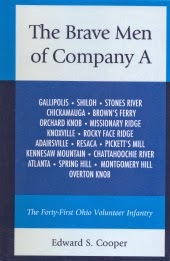 On the other hand, though the typical Civil War army company occupied a rigid place within the regimental line of battle, skirmish companies like A could have a bit more freedom of movement and Cooper’s book provides more than enough distinguishing actions in camp, on the march, and during battle to make the company-level military history exercise worthwhile reading. While the amount of manuscript material consulted by the author isn’t especially prodigious there are sufficient firsthand sources available to offer multiple perspectives from company and regimental officers and men. Their insights include useful information on campaigns and battles fought as well as other things related to army service like command politics, camp life, punishments, treatment of civilians, and health issues. Supplementing the main text are a number of capsule biographies and a list of the company dead. In terms of negatives there are more than a few typos in the book and no maps, photographs or illustrations of any kind. The presentation overall is unusually spare. The absence of a company roster, a common feature in books of this type, is similarly unfortunate. The high price might keep The Brave Men of Company A out of most personal collections but the positive features of the study make it worthy of acquisition by institutions and reference libraries. • Sires and Sons: The Story of Hubbard's Regiment by Trevor P. Wardlaw (CreateSpace, 2015). Walker's Texas Division has spawned a small number of modern regimental histories and Sires and Sons tells the story of the 22nd Texas. Like their Greyhound compatriots, the 22nd did a lot of marching in the Trans-Mississippi but experienced comparatively little in the way of heavy combat until the 1864 Red River Campaign, where the regiment fought in the battles of Fort DeRussey, Mansfield, Pleasant Hill, and Jenkins' Ferry. All of these actions are described in the book, as is the unit's first contact with the enemy at Young's Point. While the bibliography contains an appropriate range of source materials, including unpublished correspondence and a diary located in public archives and private collections, citations in the text are a bit peculiar. Many quoted passages are uncited and the O.R. is absent from both notes and bibliography though it seems likely that some of the officer reports quoted in the book are from that essential resource. There's no formal roster but the appendices include some of the author's biographical and other research findings, organized by company. A number of yearly regimental lists (e.g. of sickness, discharges, deaths, desertions, POWs, etc) are also present there. 1. Californio Lancers: The 1st Battalion of Native Cavalry in the Far West, 1863 - 1866 by Tom Prezelski (Arthur H. Clark, 2015). The state of California's 1st Battalion of Native Cavalry was composed of four companies raised in the areas in and around San Francisco, San Jose, Los Angeles, and Santa Barbara. It's Civil War service took it all over California before marching as a unit into Arizona and along the U.S.-Mexican border. In this time, they "pursued bandits, fought an Indian insurrection in northern California, garrisoned Confederate-leaning southern California, patrolled desert trails, guarded the border, and attempted to control the Chiricahua Apaches in southern Arizona." In addition to the unit narrative, the book also includes a roster of officers and men. This is the first full length history of this unique unit. 2. On This Day in West Virginia Civil War History by Michael B. Graham (The Hist Pr, 2015). I liked Graham's earlier WV book about the Civil War in the Coal River Valley and this one, while a very different kind of study, exhibits the same degree of research depth. In a paragraph or two at most, Graham basically recounts a 1861-65 military event for every day of the year. 1. I liked the first edition of A Masterful Retreat well enough, a book that summarized the Union capture and occupation of Cumberland Gap but covered in detail the 200-mile Union retreat from the Gap after the garrison was bypassed and cut off during the summer 1862 Confederate invasion of Kentucky. I missed that an expanded edition [A Masterful Retreat: The Story of 7th Division's Retreat Across Eastern KY Sept 17 - Oct 3 1862 ] with new material that, among other things, addresses some of my complaints with the original book (e.g. no bibliography and poor maps) was published last year. If page count is an accurate representation the Cumberland Gap sections have been expanded significantly, which would be a welcome development given the subject matter's more general lack of coverage in the literature. 2. Dan Vermilya posted recently on his author blog Our Country's Fiery Ordeal about a book's he's nearly completed that will focus largely on James Garfield's Civil War service. The release date is in November and the title will be James Garfield and the Civil War: For Ohio and the Union . 3. The Savas Beatie newsletter mentioned that two titles will be out this month, the second volume of David Powell's Chickamauga trilogy The Chickamauga Campaign - Glory or the Grave: The Breakthrough, the Union Collapse, and the Defense of Horseshoe Ridge, September 20, 1863 and "To Prepare for Sherman's Coming": The Battle of Wise's Forks, March 1865 by Mark Smith and Wade Sokolosky. This won't be the first book about Wise's/Wyse Fork but it will undoubtedly be the best. 4. Hail & High Water: The Battle of Elkins' Ferry, Arkansas , Joe Walker's self-published study of a small battle fought during the 1864 Camden Expedition, was released late last month.